Whether you currently have a personal trainer, or you’ve been attending boot camp sessions, you have to keep an eye on the prize. By tracking how you’re progressing day by day, you’ll be able to recognise when you’re improving and push yourself to beat your previous attempts. But just how can you track your fitness without having to add more to your workload than you can handle? Well, lucky for us, we live in an age of technological magnificence, and you can incorporate fitness tracking into your routines, without it getting in the way. Look around any gym, any fitness class, or any yoga room and you’ll see three things, a water bottle, a set of keys and a mobile phone. We take our phones with us wherever we go, we may as well harness them to benefit us in some way when we workout. With your smart phone, and a little know-how, you can transform this piece of glass and metal into a power-house of knowledge, available at the very sweaty touch of a gym-goers hand. There are apps out there for everything health, and if you can think of it, someone somewhere has created it, just for you. Leveraging the power of apps and smart phones, you can get the edge needed to tweak you daily habits and adjust your lifestyle. The 3 that we have chosen are all free to download and use, however they do have the option to sign up to a paid version to unlock more features. Whenever someone mentions fitness and mobile apps, generally one of the first they’ll mention is MyFitnessPal, and with good reason. Generally at the top of every list, this is one of our personal favourites. The app is jam-packed full of useful features, options, and areas to explore, and best of all, it’s totally free! 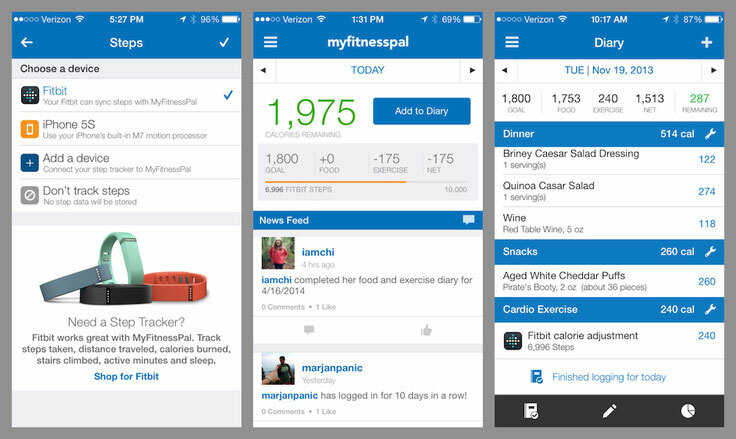 Where fitness is concerned, MyFitnessPal is generally at the top of every list of best apps. One of our personal favourites, this app is jam-packed full of useful features. We recommend downloading this app to use as a food diary. Tracking what you’re doing outside of your workouts is just as important. Keeping an eye on your eating habits will allow you to understand the changes you need to make to your daily routines, and just how much exercise is needed to burn off those pesky calories. With a very easy to understand layout, you simply enter your height, weight, goals, and other body information, then you can log and save everything you eat throughout the day. What makes this app even more fantastic is the ability to simply scan a barcode of the foods you eat. Nutritional information is pulled into your phone, and eliminates the hassle of actually logging what you eat. This app will track your calories against your goal calories (taking into account exercise) and will tell you if you were over or under your daily allowance. An absolute must-have for anyone who struggles to lose/gain weight, MyFitnessPal will help you really get to grips with your food relationship. For most users you’ll find the free version more than adequate, however if you want access to premium features, you’ll have to pay £7.99 a month. We stay stick with the freebie . One thing you should be doing is logging your activities in real time as you’re working out. ‘Strong’ is the perfect tool for you to use during your fitness sessions to fully record how you did as you do it. Recording your log in this way means you can see exactly when you improve and how much you’ve improved easily as your working hard. Strong comes pre-loaded with plenty of exercises, but you can add your own, and you can build your exercises into lists that act as your routines when working out. Select your routine and Strong will start your session timer and will begin to collate information as you enter it. When you finish your session you can see weight lifted, time spent in session, add your weight, add a progress picture, and so much more. When you start a routine you’re previous record will be clearly displayed alongside your exercises for you to quickly check where you were at and adjust the weight accordingly. 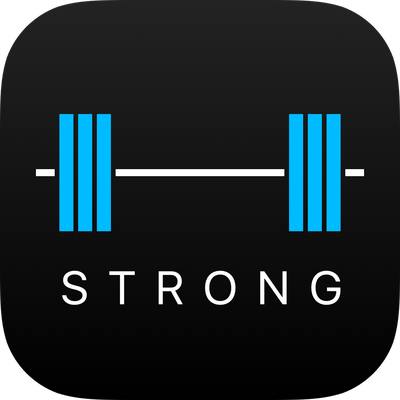 Strong is the perfect alternative to dragging a paper and pen around with you when training, and also helps you stay on track when you’re in your zone, meaning you can focus on nothing but squeezing out those last few reps.
Strong does have a free version you can use for up to 30 sessions, however we’re sure you’ll find the £3.99 price tag more than acceptable to go pro. Strong Workout Tracker has a brilliant free period that lasts for around 30 workouts, giving you more than enough time to see if it’s for you. If you decide you’d like to continue using it, and we’re sure you will, it’ll cost you a measly £4.99. Last, but by no means least, is the amazing JEFIT. An unbelievable life saver, JEFIT was originally created for body builders who wanted to fully immerse themselves in workout data. 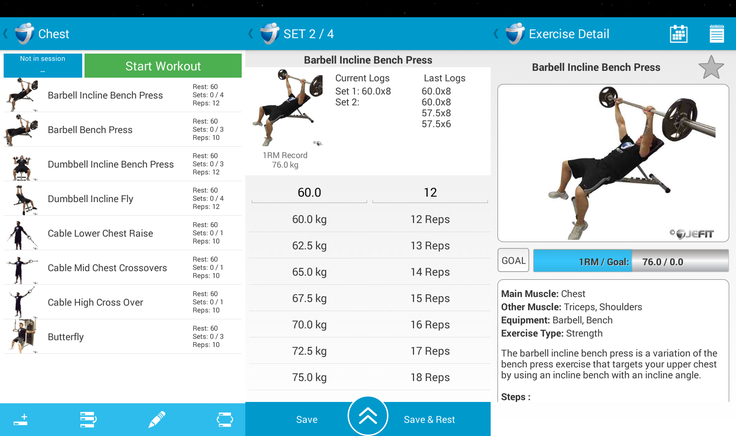 Similar to strong, you can create routines and track progress, however, we recommend downloading JEFIT to complement your other apps. JEFIT is unique because it has a catalogue of over 500 exercises that are separated into muscle group categories. If you find yourself struggling for ideas, or if you just want to double check you’re doing it right, simply open JEFIT find the exercise and you’re golden. Each exercise has a written step-by-step guide on how to perform the movement, and an animated image that visually shows you the correct technique. We recommend using this app to mix-up your routines, to get ideas and to double check anything you’re unsure of when trying new exercise. JEFIT can save you the embarrassment of looking a complete novice in the gym, but more importantly, it can save you causing yourself more harm than good. We recommend downloading the app to give you access to plenty of exercises that you can measure yourself against as you workout. For that access you’ll pay nothing, however if you do want to go for the pro version, you’ll be looking at a price tag of £4.99. We have chosen 3 apps that can be used with one another and will give you a 360° view on your fitness progress. When you can clearly see how you’re doing and have a record of your achievement, you can tailor your habits, and align them with your goals. If you’re currently struggling to reach your goals, or if you’re looking to inject some life into you routine, get in touch to find out about our personal training sessions. We currently have spaces available to take on new clients, but be quick, spots fill up fast.